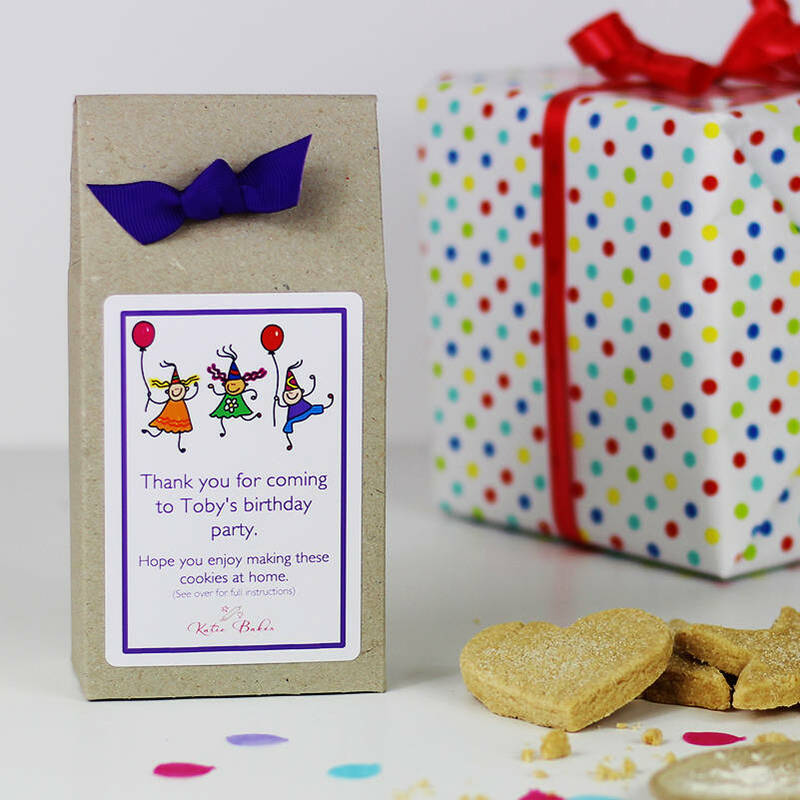 A fantastic, party themed, personalised party bag containing a rich shortbread biscuit mix for your party guests to bake at home. 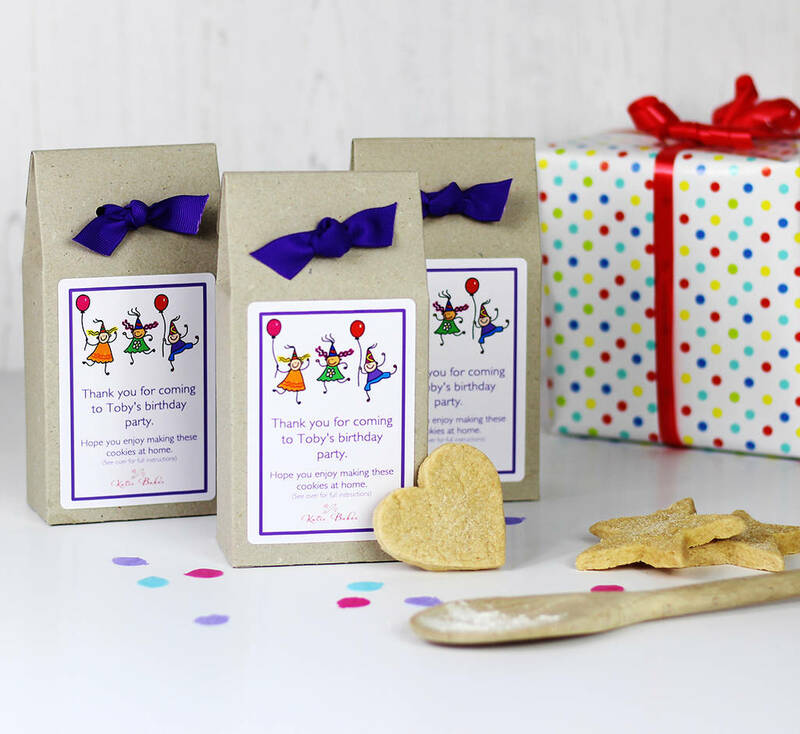 Perfect for both boys and girls, these foolproof shortbread biscuit mixes, which produce delicious results are packaged in fun personalised gift boxes and are perfect for you guests to take home as a party bag. They also make a great gift for any occasion, feel free to add your own message. Perfect as a birthday gift, to say thank you, or good luck. The cookie mixes are presented in stylish, eco friendly boxes, with a choice of themed labels, which can be personalised with any message. The boxes are then finished with a colour coordinated, hand tied ribbon decoration. The mixes, which are blended by hand, contain the highest quality ingredients, including British flour and no artificial colours or flavourings. Each mix just requires the addition of melted butter (or dairy free alternative) to make delicious cookies. Full baking instuctions are included. The message on the label will read as follows: "Thank your for coming to <name(s)>'s party. Hope you enjoy making these cookies at home." 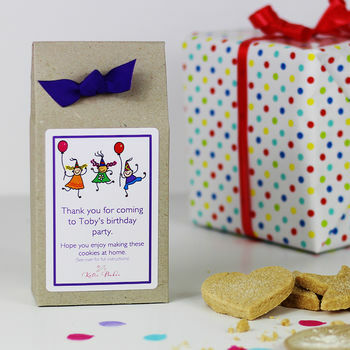 Please supply the party child's (or children's) name(s) in the personalisation box at the time of ordering or an alternative message to suit your occasion. Please use the drop down menu (rather than the small quantity box ) to select the quantiy of mixes you require, this enables us to offer lower prices for larger quantities. If we don't have the quantity of mixes that you require listed, please contact us and we can add the relevant option. Please note that when purchasing 25+ party bags of one design the unit price will reduce to £3.50 and 35+ will be £3.35 each. Why not add metal star shaped cookie cutters to your order, again please contact us if the required quantity is not listed. The gift boxes are made from recycled cardboard with a Grossgrain ribbon decoration. The mixes in the boxes are packaged in polypropylene bags for freshness. Whilst the mix does not contain nuts they are produced in an environment which handles nuts. Optional cookie cutter is made from tinplate. Gift box dimensions H 16cm x W 8cm x D 4.5cm. The box tapers at the top.